Enjoy every minute of your holiday with your children at the cheerful family hotel in Leogang. The fun starts right outside the door: sport, fun, nature experiences and lots of space – what more could you ask for? The kids would prefer to go to the sea? Certainly not if you tell them what they can experience during a holiday in the province of Salzburg. And a summer holiday in Leogang isn’t for “babies”, as there’s lots of action at and around your family and sport hotel Bacher – both inside and outside. You’ve come to the right place with your offspring, be they lively toddler or cool teenager. Read now what your family summer programme has to offer. 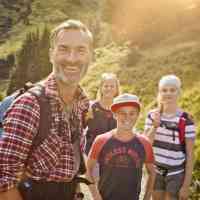 Biking, swimming, sliding, climbing and much more: Every day of your holiday flies by with the options for children at the family hotel Bacher and the countless action and sport adventures with the free Saalfelden Leogang Card. 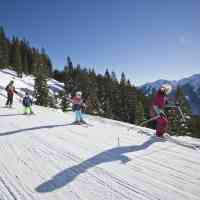 From the breakfast table directly onto the ski slope: That’s what a winter holiday with children at the family hotel Bacher in Leogang is all about. 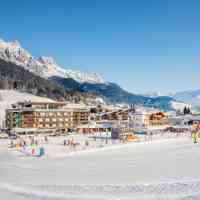 Leo’s Kinderland, the children’s ski area with practice area, and the ski school are directly outside the hotel. The Asitzbahn valley station is only a snowball’s throw away and at the end of the ski day you can ski directly to the hotel door. Look forward to 270 marked kilometres of slopes – wide downhills for families and beginners of all ages. Parents with children enjoy genuine VIP status in our family-run operation. Spend an adventurous and diverse summer and winter holiday with your offspring in a casual, down-to-earth atmosphere. We want you to feel comfortable and make sure of that with spacious family rooms, heartfelt hospitality and a special children’s menu. By the way: pay up to 50% less for your children, so the next family holiday can fit into the budget.